I've been watching Carranger, and I'm actually enjoying the silly aspects of it. I've finally gotten around to giving Madan Senki Ryukendo a chance after a few people around here recommended it what feels like an eternity ago at this point. This show seriously deserves more attention than I've been giving it. I'm 12 episodes in and I have absolutely nothing negative to say. This show is amazing. 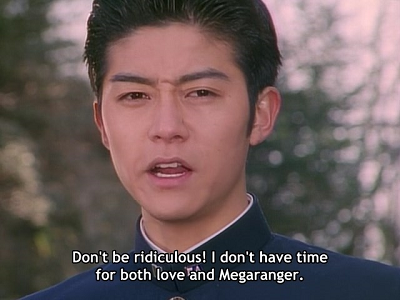 Not only has it filled the Carranger-shaped hole in my heart, but I'm pretty sure I like it even more than that show, which is nuts, because I loved that show so much it... well, so much it left a hole in my heart when I realized I'd finished watching it. For one thing, watching the first few episodes, it dawned on me I'm apparently very nostalgic for the aesthetics of early-to-mid 00's tokusatsu, which wasn't something I'd ever consciously thought about before. It probably helped that Ryukendo is a show made in 2006 that looks like it was made several years earlier. More important than that is the simple fact that the show is absolutely brilliant. It defies the laws of nature and manages to both have, and eat its cake at the same time. 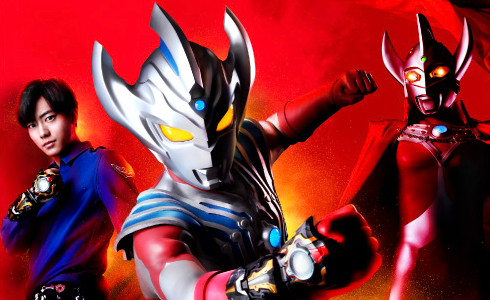 A show that embodies all the most generic toku hero tropes there are, while also constantly undermining and ridiculing them, while ALSO managing to keep a sense of drama in spite of all this. This is the part where I wish I was posting about this show on an episode to episode basis, because I'm not sure I can do the writing justice without directly summarizing entire scenes. Ryukendo is essentially a loving sendup of its genre, but the way it pokes fun at all the usual conventions is generally more subdued than a straightforward parody would be. There are many subtly subversive moments that aren't even strictly played as jokes, but are absolutely hilarious if you know how things are "supposed" to go. Heck, they even manage to do it dramatically in some instances, such as when the only serious bad guy in the show proves how tough he is by throwing etiquette to the wind and hitting Ryukendo while he's about to change forms. The entire world of the show is just "off" in some way. The way everything from the heroes, the villains, the cops, the small town under attack, and the "new products" are treated passes for normal at a glance, but look even a little bit closer and you'll see how twisted it all is. Where this became really impressive to me is that, underneath all that (or maybe above, I'm kind of losing track of all the layers here), the episodic plots, character building, and comedy that isn't satirical in nature, are all totally up to snuff, and are probably better than a lot of other shows. There's all the heroic action, devious bad guys, wacky antics, and dramatic turnarounds you could want, and Ryukendo is careful never to do anything that truly compromises that. This takes a show that could've merely been an amusing distraction and elevates it into something a lot more memorable. Needless to say, I'm looking forward to watching the rest of it. Now that I'm halfway through Ryukendo, it seems like a good time to talk about how awesome it is again. I sort of instinctively compared it to Carranger in my last post, but, especially seeing how it's been evolving in the extra dozen or so episodes I've now seen, I think that probably gives the wrong impression. It's really hard to put Ryukendo in any one kind of box, because in a lot of ways it's totally unique. To the point that even that last statement is contradicted by how gleefully the show uses so many stock concepts. Hopefully by the time I finish it I'll actually be able to praise it in a way that isn't rambling and incoherent, but right now my main takeaway is that I haven't seen a show as happy to exist as Ryukendo is in a long time. It has so much fun just being itself that I can't help but respect it. It's a show so enjoyable even the clip show is legitimately entertaining, and if that ain't high praise, I don't know what is. but right now my main takeaway is that I haven't seen a show as happy to exist as Ryukendo is in a long time. It has so much fun just being itself that I can't help but respect it. It's a show so enjoyable even the clip show is legitimately entertaining, and if that ain't high praise, I don't know what is. What I loved about it when I got around watching it was how local Ryukendo and his pals were being restricted to Akebono. Last edited by Sunred; 03-22-2019 at 08:18 AM..